The British Indian Ocean Territory (BIOT) or Chagos Islands is an overseas territory of the United Kingdom situated in the Indian Ocean halfway between Tanzania and Indonesia. 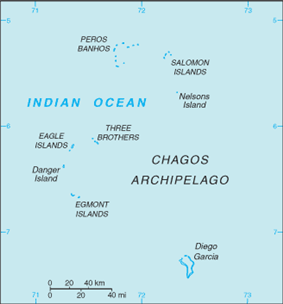 The territory comprises the seven atolls of the Chagos Archipelago with over 1,000 individual islands – many tiny – amounting to a total land area of 60 square kilometres (23 sq mi). 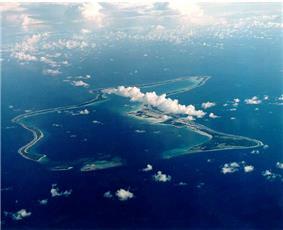 The largest and most southerly island is Diego Garcia, 44 km2 (17 sq mi), the site of a joint military facility of the United Kingdom and the United States. Following the eviction of the native population, the Chagossians, in the 1960s and 70s, the only inhabitants are US and British military personnel and associated contractors, who collectively number around 4,000 (2004 figures). The islands are off-limits to casual tourists, the media, and their former inhabitants. During the 1980s, Mauritius asserted a claim to sovereignty for the territory, citing the 1965 separation as illegal under international law, despite their apparent agreement at the time. The UK does not recognise Mauritius' claim, but has agreed to cede the territory to Mauritius when it is no longer required for defence purposes. The Seychelles also launched a sovereignty claim on several of the islands. On 1 December 2010, a leaked US Embassy London diplomatic cable exposed British and US communications in creating the marine nature reserve. 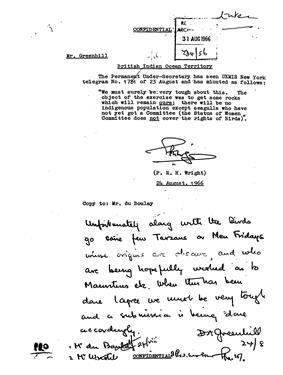 The cable relays exchanges between US Political Counselor Richard Mills and British Director of the Foreign and Commonwealth Office Colin Roberts, in which Roberts "asserted that establishing a marine park would, in effect, put paid to resettlement claims of the archipelago's former residents." Richard Mills concludes: "Establishing a marine reserve might, indeed, as the FCO's Roberts stated, be the most effective long-term way to prevent any of the Chagos Islands' former inhabitants or their descendants from resettling in the British Indian Ocean Territory." The cable (reference ID "09LONDON1156") was classified as confidential and "no foreigners", and leaked as part of the Cablegate cache. As a territory of the United Kingdom, the head of state is Queen Elizabeth II. There is no governor appointed to represent the Queen on the territory, as there are no longer any native inhabitants. The head of government is the commissioner, currently Dr. Peter Hayes (since October 2012, replacing Colin Roberts), and administrator John McManus (since April 2011, replacing Joanne Yeadon), all of whom reside in the United Kingdom. The commissioner's representative in the territory is the officer commanding the detachment of British forces. The laws of the territory are based on the constitution, set out in the British Indian Ocean Territory (Constitution) Order 2004, which gives the commissioner full powers to make laws for the territory. Applicable treaties between the United Kingdom and the United States govern the use of the military base. The United States is required to ask permission of the United Kingdom to use the base for offensive military action. The territory is an archipelago of 55 islands, the largest being Diego Garcia, accounting for almost three-quarters of the total land area of the territory, which is 60 km². The terrain is flat and low, with most areas not exceeding 2 metres above sea level. The climate is tropical marine; hot, humid, and moderated by trade winds. In 2010 545,000 square kilometres (210,426 sq mi) of ocean around the islands was declared a marine reserve. With the exception of one four-lane motorway, most of the islands in the territory have no roads of any sort. Diego Garcia has a short stretch of paved road between the port and airfield; otherwise transport is mostly by bicycle. Diego Garcia's military base is home to the territory's only airport. At 3000 metres long, it is capable of supporting heavy USAF bombers such as the B-52 and would have been able to support the Space Shuttle in the event of a mission abort. It also has a major seaport. The BIOT Patrol Vessel, the MV Pacific Marlin, is based in Diego Garcia. It is presently operated by the Swire Pacific Offshore Group under a 4 year contract with the BIOT Administration which was renewed on 1 Jan 2011. The MV Pacific Marlin patrols the marine reserve all year, and since the marine reserve was designated in April 2010, the number of apprehensions of illegal vessels within the area has increased. The Pacific Marlin was built in 1978 as an oceangoing tug. It is 57.7 metres long with a draft of 3.8 metres and gross tonnage 1,200. It has a maximum speed of 12.5 knots with an economic speed of 11 knots, permitting a range of about 18,000 nautical miles and fuel endurance of 68 days. It is the oldest vessel in the Swire fleet. Construction projects and various services needed to support the military installations are carried out by military and contract employees from Britain, Mauritius, the Philippines, and the US. There are no industrial or agricultural activities on the islands. The licensing of commercial fishing provides an annual income of about $1 million for the territory. Amateur radio operations occur from Diego Garcia, using the British callsign prefix VQ9. An amateur club station, VQ9X, was sponsored by the US Navy for use by operators both licensed in their home country and possessing a VQ9 callsign issued by the local British Indian Ocean Territory representative. However, the US Navy closed the station in early 2013, therefore any future licensed amateurs wishing to operate from the island will have to provide their own antenna and radio equipment. ^ a b c d e f British Indian Ocean Territory (British Overseas Territory), Foreign and Commonwealth Office. Retrieved 24 November 2012. ^ This refers to total area, including water. Actual land area is 60 km2. ^ This refers to total area, including water. Actual land area is 23 sq. miles. ^ a b c "About Us". BIOT Post Office. Retrieved 5 April 2013. ^ a b c d "British Indian Ocean Territory". World Factbook. ^ "HISTORICAL BACKGROUND - WHAT HAPPENED TO THE CHAGOS ARCHIPELAGO ?". chagosinternational.org. Retrieved 4 April 2012. ^ Vine, David (17 April 2008). "Introducing the other Guantanamo". Asia Times (atimes.com). Retrieved 5 April 2013. ^ Baker, Luke (25 May 2007). "The coral sea vista opened up by British judges". ^ Knapton, Sarah (21 October 2008). "Law Lords to rule on whether Chagos Islanders can finally return home". ^ "Britain wins appeal over Chagos islanders' return home". ^ "HMG Floats Proposal for Marine Reserve Covering Chagos Archipeligo (British Indian Ocean Territory)". The Daily Telegraph (telegraph.co.uk). 4 February 2011. Retrieved 5 April 2013. 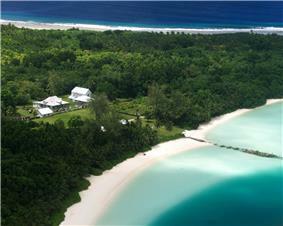 ^ a b c "HA08, British Indian Ocean Territory (BIOT) Chagos Archipelago, United Kingdom". ^ North Sea Marine Cluster (2012). "Managing Marine Protected Areas". NSMC. Retrieved 5 February 2013. 96–126Northwestern Journal of International Human RightsChristian Nauvel, "A Return from Exile in Sight? The Chagossians and their Struggle" (2006) 5 (retrieved 9 May 2011).